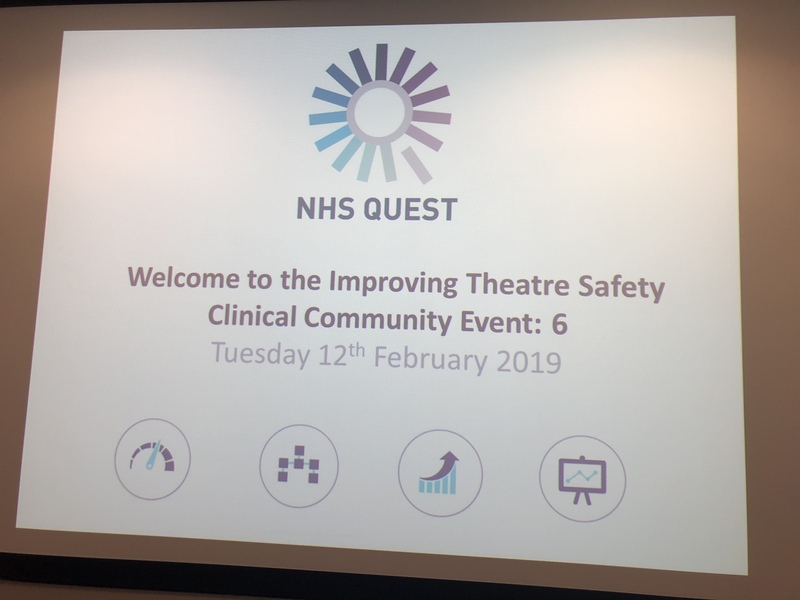 Welcome to the live event blog from the sixth Improving Theatre Safety Clinical Community event, held on Tuesday 12th September 2019 at Bradford Teaching Hospitals NHS Foundation Trust. Follow us on twitter and use #TheatreSafety to join the conversation. NHS Quest Trusts strive to have the safest operating theatres in the country and are undertaking a programme of work to develop exceptional safety awareness and healthy departmental cultures in this often high-pressure environment. Members are utilising their strengths as a national network to learn from each other and share new innovative approaches in their mission to ensure patients receive the safest possible surgery, every time. Using the clinical communities model, member trusts combined their expertise in June 2017 to launch the next stage of this ambitious improvement journey. At the second meeting, a packed agenda was built around the theoretical framework of Deming’s Lens of Profound Knowledge and Rogers Diffusion of Innovation. Watch interviews with members in a short film, capturing the journey so far. 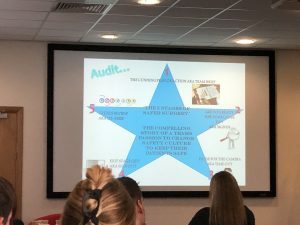 The third event was held in February 2018 and is captured in this event blog from Zoe Egerickx, NHS Quest Director. You can also catch up with what happened at our fourth and fifth events here. We start the day with welcome and introductions from Stuart Clough, Senior Improvement Advisor at NHS Quest. One of the main focuses of today’s agenda will be to share and learn from the clinical community, and to reflect on the improvements that have been made so far. Stuart moves on to a recap of event 5 that was held back in September. One of the key themes from event 5 was looking at storytelling, and how this can become a part of an improvement journeys. We take a few minutes to review the Theory for Change, and Stuart asks whether the group thinks that this still relates to their improvement objectives. The first activity of the day asks attendees to use some blue- sky thinking: if you had no constraints, what would the perfect debrief look like to you? We then move on to question why does it not look like that? What stops this? Reflections: staffing levels are a problem, timings, generating a feeling that makes a difference, having ownership of tasks, showing the value of tasks. Stuart introduces Dr Bryan Gill, Chief Medical Officer at Bradford Teaching Hospitals NHS Foundation Trust. Dr Bryan Gill asks the question of what is it about safer surgery that motivates people? It is the people. Safer surgery is a top priority for the trust, and it is the people and the value the trust gives them that can improve this. There is momentum building for quality improvement. Dr Brian Guild encourages the room to just do it, to just go and test it. Bradford Teaching Hospitals have recently merged their quality improvement and service improvement; this ensures that the efficiency and success of care can be managed across the board. He asks the room, what is our role in ensuring the patients start to finish journey is safe, not just in theatre. We move on to our series of site presentations. The first presentation is from our hosts Bradford Teaching Hospitals NHS Foundation Trust who start by explaining their initial problem, debriefs were not being used. They noticed that there was no drive for their debrief, they implemented a poster with hints and tips, but this failed to engage the requirement to actually use the debrief. The team chose to implement the ‘Plymouth’ brief-debrief form using open-ended questions to help lead the debrief. The form allowed the team to track which staff were present at each debrief, to see whether it was the same people missing regularly. The form also covered scheduling, equipment and safety/human factors. Alongside the form, Bradford’s team tested several other changes: fasting times, implementing a ‘golden patient’ to improve start times, and looking at the small improvements than can impact on a much larger improvement. One of the key learning points has shown the importance of making staff feeling empowered by breaking down barriers, and flattening the hierarchy. So what are their next steps? The team pose a question to the group: when is the right time to use a debrief? They close their presentation by showing a film of a great debrief in use by empowering staff. The next presentation is from Western Sussex Hospitals NHS Foundation Trust. Western Sussex starts by looking at the benefits of briefs and debriefs: prevention, efficiency, staff morale, and of course patient safety. Their briefing and debriefing journey began back in 2010, noting that inspiration in particular came from Suzette Woodward’s session at the July 2018 NHS Quest event. Western Sussex now have a quality brief undertaken in all theatre areas, most of the time, and a quality debrief undertaken some of the time. They have identified several barriers to debriefing including; finding an appropriate time, staff not feeling empowered to take the lead, and not realising the benefit a debrief can have. The next step is a conversation, to audit the process and to further embed the use of a debrief. The third team to present are Homerton University Hospital NHS Foundation Trust. Homerton explained how they developed a survey to understand how debriefs are currently being used in theatres. Their survey received a lot of responses from nurses, but the teams noted that the survey didn’t reach HCA’s – and this is something they would look to improve in the future. As part of their PDSA the team wanted to discuss the previous days debrief in the team huddle. They found that information discussed in the team huddles often wasn’t being resolved, it would just be discussed again the next day. To combat this they implemented a form to capture the actions and to mark when each of those is completed. The team pose the question to the group; what measures can they use to evaluate the effectiveness? Sheffield Teaching Hospitals NHS Foundation Trust are the fourth team to present today. They have created a role (12 month secondment) which started in November last year, of a Band 6 senior practitioner based within the clinical governance team- known as the Quality Sisters. Their main responsibility is for operating theatres, but they work collaboratively across projects and departments. The Quality Sisters explain how they began with an audit of the 5 stages of safer surgery and so far have completed 100 audits across both their sites. Next up are Royal Surrey County Hospital looking at their Wellbeing in Work initiative (WinWin). This initiative looked at staff burnout, what causes it, and the effect it has on staff. The IHI Joy in Work framework notes that 50% of physicians report symptoms of burnout. So what interventions can they offer (psychological, organisational and physical) to improve this? They began with a survey using the Oldenburgh Burnout Inventory. The survey captured 114 respondents across theatres and ICU- and results indicated that 70% were at a high risk of burnout. Royal Surrey decided to implement 3 simple things: revamping rest areas, making staff feel listened to (what matters to you conversations), and looking at recognition and rewards. Calderdale and Huddersfield NHS Foundation Trust are the sixth team to present , looking at their development programme. Their development programme was offered to band 3 members of staff to increase their knowledge and responsibilities. Following this, they then began work on a band 6 development programme for theatre practitioners. This was a 6 week programme themed around development, with guest speakers at each session. The end product of each cohort was a project, which was presented at the Nursing Conference. Kicking off the afternoon is Royal United Hospitals Bath NHS Foundation Trust. RUH Bath started by showing results from their work so far. Across three theatres, there has been a 70% compliance with the debrief. There have been challenges throughout including: staffing, timescales, pressure and challenging processes outside theatres. However, the trust note the benefits of using a debrief: team work, team culture, positivity and thanks, and having access to real time data. Their next steps will be to spread this to all theatres, whilst building the most valuable tool = staff. The final presentation is from Wrightington, Wigan & Leigh NHS Foundation Trust (WWL). WWL start by sharing the human element to some of the conversations today. Quality Improvement is often dependent on one person, or a small group of people, to lead this change. There have been stumbling blocks when there is a loss of engagement from staff regarding change projects. These human factors can have large impacts on change. How many adaptations did you make? Did you gain success? What impact did it have? Did you have any challenges? How did you get around these? Do you have any common changes? Were they successful in both sites? Now working in groups on their tables, groups are asked to theme up the changes, and then rank them in order; most impactful to not so successful. What key learning was taken from these changes? Did anything come as a surprise? Did you need any executive support? To close what has been a fantastic and informative day, Stuart asks the group to think about how they can keep going with some of these projects after the clinical community series of events ends. Lesley Jordan, Clinical Community Clinical Lead and Consultant Anaesthetist at Royal United Bath NHS Foundation wraps up the day. She touches on how great it has been to hear from a variety of projects, with a focus on getting feedback. There has been a real push in the sessions today to focus on staff and how we can support and empower them. Lesley ends by reminding the group that we don’t need to focus on making the debrief perfect, it is still just as useful in any format possible.